We created these designs in 2006 to celebrate Benjamin Franklin’s Tercentenary, or 300th birthday, but the pithy and often humorous quotations of this statesman, patriot and United States Founding Father remain timeless and immortal in their common-sense wisdom! This is just a small collection of his best-known comments. If you have a favorite Ben Franklin quote that you don’t see here, but would like to have on a giftware or apparel item, please don’t hesitate to contact us and ask. We will be happy to add more to this collection, and we can do it very quickly, too! Ben’s pithy words of wisdom concerning Life and Time. 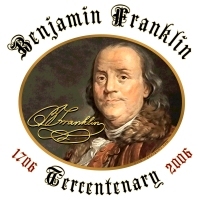 Celebrate 300 years of Ben with this design! Ben’s thoughts on people who are wrapped up in themselves. 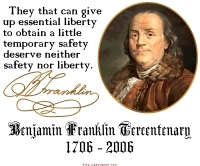 Liberty of safety? Ben believed the former was paramount! He had their number, and he didn’t suffer them gladly! The more some things change, the more they stay the same! … and the pursuit thereof, as in the Constitution. Ben loved his suds, and he’s all right with us! True riches are found in contentment with one’s lot in life. Only things certain in this world are Death and Taxes! and Medicine, most of which is Worthless! Life is uncertain, so we should plan accordingly! Controlling one’s reaction to one’s circumstances, that is. Blessed is he without any, per Dr. Ben! We’re all born that way, but some work hard to remain stupid. Not shy about flatulence, Ben displays his earthier side. Knowing one’s self is undoubtedly the hardest. At least the ignorant blockhead has a chance!